Leon LaBrecque, JD, CPA, CFP, CFA and Chief Strategist, LJPR, LLC has written a comprehensive White Paper, outlining both the new US Supreme Court ruling on IRAs and some solutions to the problems it has created. “Earlier this year, the U.S. Supreme Court* held that funds from an inherited IRA are not protected under bankruptcy — a ruling that will have a significant impact on how you designate your IRA beneficiaries.” says Leon LaBrecque, JD, CPA, CFP, CFA. Leon is also the Chief Strategist and founder of LJPR, a firm managing $655 million** in assets. Leon has written a comprehensive White Paper, outlining both the new ruling and some solutions to the problems it has created. “IRA trusts can provide spendthrift protection and protect against lawsuits, general creditors and poor financial decisions of the beneficiary. The IRA trust can mandate required minimum distributions only (unless the trustee determines otherwise). These special trusts can also provide extra protection and control of the IRA for the benefit of a disabled beneficiary,” says LaBrecque. 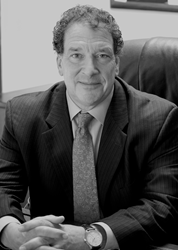 Leon C. LaBrecque is the managing partner and founder of LJPR, LLC, an independent wealth management firm located in Troy, Michigan that manages $655 million in assets (as of 5/30/2014). Leon is a practicing attorney, CPA, CFP® and CFA that has specialized in servicing individuals, families, and small businesses in the areas of financial, estate, and tax planning for over 32 years. LaBrecque’s extensive career includes previous work at Arthur Andersen, Plante Moran, and as the Department Chair of Finance and Economics at Walsh College where he created the Master of Science in Finance program. He has also authored several proprietary retirement planning programs for CalPERS, the states of Montana, and Washington, and corporate clients including General Motors, Ford Motor Company, Lucent, and AT&T, among others. LaBrecque’s specialties include investment management for foundations and non-profit organizations, financial planning for automotive employees and retirees, and retirement planning for police officers and firefighters. Leon LaBrecque’s direct e-mail is leon.labrecque(at)ljpr(dot)com. For an interview with Leon, call Josephine at 734.385.6170. **As of May 30, 2014.